Anyone and everyone who has used Windows has, at some point in their lifetime, heard that Windows is less secure than other operating systems.In the past people made this claim when referring to the potential of the operating system to fall victim to viruses and malware as well as the ease at which it is hacked. But today things are a little different. While Windows systems are still susceptible to more security vulnerabilities than other operating systems, especially free open source ones, there are other concerns that are built into the default settings of the operating system. There are settings that will allow a lot of personal information to be sent back to Microsoft. On our online privacy page, we outline the risks of proprietary software. Windows 10 contains a lot of similar issues as the past versions of Windows, such as buggy code when the operating system is first released. Prior to service packs, new versions of Windows are often littered with flaws. But the largest complaint with the newest version of Windows is the amount of data Microsoft Corporation is mining from their users. We often advise on the use of VPNs on Windows as a way to secure your data, but when the OS is at fault, additional measures are required. When installing or upgrading to Windows 10, a lot of people select the express setup option because it’s easier, faster, and you need less technical know-how to complete the operation.To put things bluntly, it is the path of least resistance. But there is a huge problem with using the default settings in the express setup process. Without editing any of the default settings, your operating system will transfer vast amounts of data back to Microsoft. Things such as location, browsing habits, and other key pieces of information that Microsoft can use to better understand demographic information and the habits of their users. They can even collect information relating to your calendar, contact lists, touch input, and many, many other pieces of information. Though it’s true that this isn’t the first version of Windows to collect similar pieces of information, I would say that Windows 10 is probably the most aggressive. Past versions of Windows also had similar features enabled by default, but Windows 10 is really seeing how far it can take things. It has many more options to transmit data than any other previous version of the operating system. The downside is that some of the data reporting programs are tied to some features that people would really find useful – such as Siri’s competitor, Cortana. But that’s just one example and there are many unique facets of the information and data reporting programs that are tied into other useful features of the operating system. But remember, you need to be extremely concerned with the amount of data you share online. After Snowden showed the world the extent by which the N.S.A. had coerced companies (such as Google, Yahoo, and many others) into forfeiting sensitive information about their users, you should definitely take offense to the amount of data that Windows 10 collects by default. In addition, you should understand how to take action to disable these settings so that Windows 10 isn’t essentially a spy for Microsoft. An ounce of prevention is worth a pound of cure, and the very best way to prevent Windows 10 from reporting boatloads of information about your computer usage is to disable them from the very beginning during the installation process. The bad news is that most people don’t think to disable these settings during installation, so they will need to disable them manually. So Take caution if you are going to upgrade or install Windows 10. If you have an opportunity to disable these settings from the get-go, then do so. To disable these probing settings from the installation process, make sure you click on the “Customize settings” options in the bottom left of the blue installation screen. After you have chosen to customize your settings, the very first page will show you four different slider-bars that all need to be disabled. 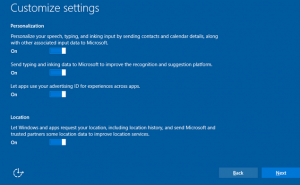 By disabling these settings, you will prevent Windows 10 from sending location data back to Microsoft, which is really pretty frightening to think about. In addition to disabling these settings, you may want to refrain from logging into your computer with a Microsoft account. The more secure and less intrusive way is to simply create a user account that only exists on your local computer. To do so, begin by clicking on “Create a new account” instead of entering the username and password of your Microsoft account. Next you will need to click on the option that says “Sign in without a Microsoft account.” This will help remove the association between an online Microsoft account and the data that is generated on your computer. But there is one caveat. Remember how I warned that there is a tradeoff between functionality/features and security? By disabling the Microsoft account at login, you won’t be able to sync settings among you various Microsoft devices. Honestly though, that is a small price to pay for preventing your computer from sending information back to Microsoft. After you have made these changes, you can complete the installation or upgrade procedure and boot into your new operating system. But wait just a moment, because we aren’t done yet. You now need to log in with your local user account and fire up the settings app and click on the privacy button to make some more changes. Most of the settings on this tab should have already been disabled when we changed the default values during installation, but it never hurts to double check. In addition, you may want to go ahead and disable the SmartScreen Filter option you see here. As you may have guessed if you’re a video game nerd, the Cortana feature gets her name from a character in the game Halo that was released exclusively for Microsoft Xbox. But regardless of her origins, just know that she is a threat to your security because she send more information back to Microsoft. To disable her, simply start by clicking on the start button and typing some text to make the search window pop up. You should see the settings icon appear and there you’ll have the option of completely disabling Cortana. Alternatively, you can choose to only disable a few features, but be advised that the option that promotes the highest level of security is to completely disable her altogether. Now that you have made all of these tedious changes, your personal privacy, Internet security, and anonymity have all been significantly bolstered. 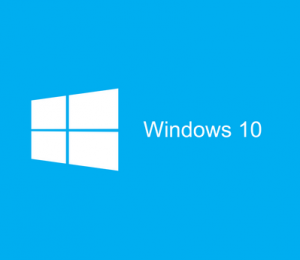 You have also effectively minimized the amount of information that your Windows 10 device will send back to the Microsoft Corporation. To reiterate, it may seem like a drag having to sacrifice a few small features in exchange for better security, but it is only a small price to pay. Do you really want Microsoft observing, tracking, and storing your usage habits? I wouldn’t think so. However, on a happier note, most of the features that we turned off during the setup process don’t really provide the user with any benefits, so at the very least you should go ahead and disable those. There are still a couple more things you can do to enhance your security on Windows 10, and one of them revolves around the “Feedback Options” settings. You can’t completely disable this setting by default, but you can severely limit how it functions by configuring it to run on basic mode. Just know that the only way to completely disable this feature is contained within the Enterprise and Server editions of Windows 10. Believe it or not, Windows 10 propagates updates to other Windows 10 devices in the same manner that Bit torrent applications share files. By using P2P technologies, Microsoft can significantly reduce the amount of resources that are used by their update servers. But it is undesirable to have your computer supplying other devices on your network with updates, so you may want to go ahead and disable this feature. To change this behavior, open the Settings app and find the Update and Security section, then click on Windows Update, Advanced Options, and then choose a desirable setting for how you want Windows 10 to handle software updates. You have the option of completely shutting down this feature or only allowing updates to be sent to computers in your immediate area (LAN). The coding community was quick to reply with scripts and applications designed specifically to completely remove and/or disable any Windows 10 spying apps. Some apps offer more advanced and comprehensive functions but for this section, I suggest two solid tools that have feedback since launching, and are easy to use for beginners. My first and top suggestion to use is ‘Destroy Windows 10 Spying‘, as it can appeal to all levels of users and is very simple for beginners. Instead of shifting through all the options manually, you can quickly select what you wish to disable from the app’s interface, effectively removing key logging and tracking features with one click. Another similar and simple to use app that seems to work very well is W10 Privacy. 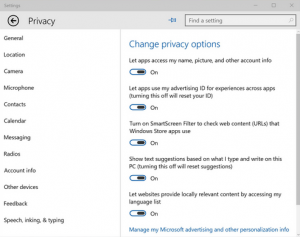 With a similar list of features, you can quickly remove all Windows 10 spying features. The knowledge that Microsoft collects all of this information about you and stores it in some analysis programs is a really frightening though. As users, we don’t have 100% control over what data is collected from our computers by Microsoft since we didn’t design and code the operating system. But by following this guide, you can drastically reduce the amount of information that Microsoft collects from your computer and thereby increase your security and privacy. Unfortunately, we have no way of knowing every tiny little piece of information that Microsoft collects without access to the source code.